Health and fitness aren’t just about appearance. It is about feeling better, having more energy, being less of a burden to your family, saving money (health problems are very expensive), being a better servant for the kingdom, and more. Nobody likes diet tips from lean people, so I never give them in person. Hopefully it will be a safe thing to do via a blog. I was blessed with a high metabolism, so I don’t assume that it is easy for everyone. But I eat what I want, when I want, and never gain weight. That was a real drag when I was young and obsessed with gaining weight, but it isn’t so bad now. These may seem like obvious tips, but consider that there are so many horrible diet programs out there that promote all sorts of counterproductive behavior. It is all about habits. Going on and off diets makes the problem worse. Obsessing about food also makes it worse. Just do a lot of small things: Eat often (yea! 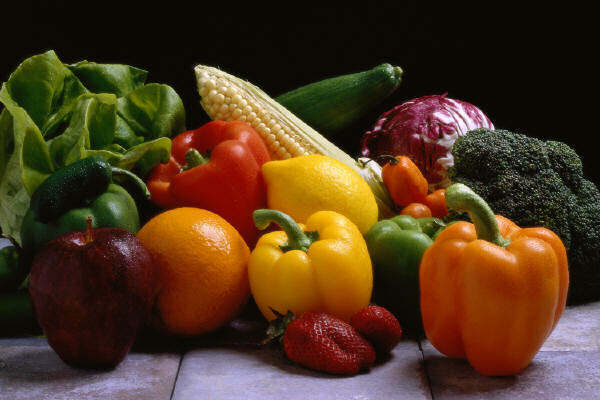 ), eat healthy things first, eat a little less, eat a little healthier and exercise a little more. No fad diets. No extreme workouts. Just make some small but permanent changes to your habits. Eat often. Seriously, when I eat often I eat pretty healthy foods and don’t crave junk. But the hungrier I get the more I crave things like McDonald’s. Don’t let yourself get too hungry. Eat healthy foods first. They fill you up so you don’t eat as many bad things. You can enjoy treats, but don’t start with them. Eat smaller portions. Humans were not meant to eat giant plate fulls of fatty foods along with multiple high-calorie beverages. You should have leftovers from 90% of restaurant meals. Getting regular exercise and sleep help your metabolism. Exercise burns calories, increases metabolism and reduces your appetite, so even a little bit it helps you in three ways. Ironically, sleeping too little has been shown to decrease your metabolism. Exercise can be as simple as going for a walk a few times a week. People set themselves up for failure when they assume it has to be an intense, daily, 90 minute ritual. Find something you like well enough and do that. It won’t feel so much like exercise. My wife and I took up ballroom dancing a few years back. It isn’t my primary exercise, but it does have a lot of benefits. My point here is that I never think about it as exercise, just as one of my hobbies. I’ve seen people lose tons of weight and get much more fit by ballroom dancing. Eat breakfast – its the 4th most important meal of the day! Apparently skipping breakfast is bad for your metabolism as well. I love breakfast foods. I could eat them three times a day. If you just eat a little less and a little healthier and exercise a little more, many positive things will happen. BONUS: Here’s the latest incarnation of my Veggie Boy smoothie recipe. One of my first posts ten years ago (have I been blogging that long?!) was about my not-quite-patented Veggie Boy smoothies. I figured I was due for an update. I’ve been making health smoothies for almost 40 years and have now achieved the state of the art. Here is the used-to-be secret recipe for my Veggie Boy protein smoothie. (For you Cheers fans, you’ll remember this is the name of the health drink Woody was hypnotized into liking. “You can really taste the kale!”). Yeah, there are fruits in it as well, but “Fruity boy” just doesn’t have the same ring. It is really, really healthy. Vitamins, protein, fiber, low fat, all natural, etc. Drink it for breakfast and you can eat Snickers the rest of the day. I have a couple glasses for breakfast and some more for lunch or after I work out. I never eat cooked vegetables and am fairly unlikely to eat them raw, so consuming them in smoothie form is a gigantic plus. It used to be more of a production to make the smoothies it so I’d skip it when I was busy, but with the extra power I can use more frozen things. For example, it saves a lot of time to use frozen fruit so I can just drop them in instead of cutting them up each morning. And it saves you money as well. If fruit, such as bananas, starts to go bad you can freeze it for smoothies instead of throwing it away. I hate to waste things. And when a local fruit stand was selling older bananas at 1/3 the regular price I bought a lot and froze them. The rest of the family uses it often to make more normal (read: tastier) but still quite nutritious drinks. Here’s the current recipe. Believe it or not, it tastes OK. Some frozen mixed fruit – strawberries / blueberries / raspberries / blackberries – Wal-Mart has a good deal on these and it is easier than buying them fresh. Any other fruit we’ve got. I’m not picky. Don’t tell CPS, but when Daughter #1 was young I told her one Halloween that she could eat all the candy she wanted if she had a small glass of Veggie Boy first. I thought she actually liked it (it is rather sweet tasting), but I learned years later that she choked it down. I would have let her eat as much candy as she wanted anyway. Fortunately, she is the forgiving type, and she and her sister turned out fabulously despite many parenting moments like that. P.S. I never understood the juicer concept. Seems like you are throwing out all the good stuff. Health and fitness isn’t just about appearance. It is about feeling better, having more energy, being less of a burden to your family, saving money (health problems are very expensive), being a better servant for the kingdom, and more. Nobody likes diet tips from thin people, so I never give them in person. Hopefully it will be a safe thing to do via a blog. I was blessed with a high metabolism, so I don’t assume that it is easy for everyone. But I eat what I want, when I want, and never gain weight. That was a real drag when I was young and obsessed with gaining weight, but it isn’t so bad now. Just do a lot of small things: Eat often (yea! 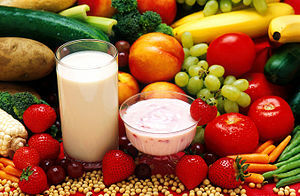 ), eat healthy things first, eat a little less, eat a little healthier and exercise a little more. No fad diets. No extreme workouts. Just make some small changes to your habits. Eat healthy foods first. You can enjoy treats, but don’t start with them. Eat smaller portions. Humans were not meant to eat giant plate fulls of fatty foods along with multiple high-calorie beverages. Getting regular exercise and sleep help your metabolism. Exercise burns calories, increases metabolism and reduces your appetite, so even a little bit it helps you in three ways. Ironically, sleeping too little has been shown to decrease your metabolism. Exercise can be as simple as going for a walk a few times a week. People set themselves up for failure when they assume it has to be an intense, daily, 90 minute ritual. I know people who lost a ton of weight just by taking up ballroom dancing. It isn’t that the dancing is that strenuous. They just went from consistently doing nothing to consistently doing something, and they found something that was fun and easy to stick with. If you just eat a little less and exercise a little more, many positive things will happen. Unless you are a complete invalid, you should be doing some type of physical activity. Another great reason: Exercise just as good as drugs in war on major disease. Exercise could be as effective as some of the best drugs which protect against major diseases, research has found. A study of more than 300 trials has found that physical activity was better than medication in helping patients recovering from strokes – and just as good as drugs in protecting against diabetes and in stopping heart disease worsening. Researchers said the findings suggested that regular exercise could be “quite potent” in improving survival chances, but said that until more studies are done, patients should not stop taking their tablets without taking medical advice. The landmark research compared the mortality rates of those prescribed medication for common serious health conditions, with those who were instead enrolled on exercise programmes. The research found that while medication worked best for those who had suffered heart failure, in all the other groups of patients, exercise was at least as effective as the drugs which are normally prescribed. People with heart disease who exercised but did not use commonly prescribed medications, including statins, and drugs given to reduce blood clots had the same risk of dying as patients taking the medication. Similarly, people with borderline diabetes who exercised had the same survival chances as those taking the most commonly prescribed drugs. They said there was a need for more research into the benefits of exercise for those suffering from serious health problems. Researchers stressed that they were not suggesting that anyone should stop taking medications they had been prescribed, but suggested patients should think “long and hard” about their lifestyles, and talk to their doctors about incorporating more exercise into their daily routines. Should this be surprising to us? Why would we think that we could take some pills that would accomplish more than just using our bodies as God designed them? Exercise is a broad term. I always encourage people to do something — anything! — on a regular basis. If you are one who doesn’t exercise at all, ask yourself if you’d be glad now if you had walked 20 minutes on a treadmill three times a week for the last year while watching TV or listening to the audio Bible or something. If you do more, that’s great, but at least find some minimum level of activity. You’ll be glad you did. Forget about appearance and weight. Just do it so you can feel better, have lower stress, have more energy, get sick less and ultimately be less of a burden on your family. Why, yes, I have updated my smoothie recipe. Thanks for asking! Yes, that is a total of four vegetables for a guy who will never, ever, eat cooked vegetables. Apparently heating vegetables is what unlocks their terrible taste, because when I blend them raw they don’t bother me at all. The yellow squash was a recent addition. They are super-healthy and have almost no impact on the taste. I think the key is the blueberries or mixed berries: They add a nice color and flavor. Try and enjoy! These are unbelievably healthy. You could probably eat Snickers the rest of the day and still be healthy. I told you to drink whole milk! Mainly because it tastes better, but also for health reasons. If you didn’t find that persuasive enough, read this at the Fooducate blog: Reduced Fat Milk Contributing to Obesity ?!? 2. Since reduced or non fat dairy might not be as filling as the whole version, it could lead to people consuming more. As a result, overall calorie consumption may be the same or higher than the whole version. A full fat glass of milk has 150 calories, 8 grams of fat, 5 of them are saturated fat. A glass of skim milk has 90 calories, and no fat. A glass of skim chocolate milk has 160 calories, no fat, but 3-4 teaspoons worth of added sugar! Maybe children today are drinking skim chocolate milk, whereas a generation ago kids were fine with full fat whole milk, unflavored? Overall, the calories are similar. The scientists conclude that the recommendation for 3 servings of low fat dairy per day needs to be reconsidered. By the way, another interesting point with respect to nonfat milk is nutrient bioavailability. The vitamins A, D, E, and K are a wonderful part of milk. But, they are fat soluble, which means they can only be absorbed by the digestive system in the presence of fat. If you drink skim milk, there won’t be any fat for these nutrients to get absorbed with. Once again, it is best to keep things simple. The vast majority of things in the grocery store are processed beyond recognition and not good for you. I’m not saying to never eat them. But make sure you have a foundation of basics that aren’t processed: Fruits, vegetables, dairy, whole grain cereals, etc. They will give you nutrition and fill you up. If you eat the processed stuff first your body will crave more because it hasn’t received the nutrition it needs. Oh, and the real stuff tastes better! I think that the New York City soda ban is beyond absurd. It is disappointing to see how many people can’t see the downsides of having the government try to control things like that. But I do think that sodas should only be used as treats — even the diet kinds. Brown water and chemicals are just not a smart thing to put in your body on a regular basis. Drink coffee if you want the caffeine. I realize it would take a little discipline, but if people tried drinking water instead for a few weeks they’d be amazed at the impact on their health and their wallets (drinks are probably the highest margin things on restaurant menus). My brother-in-law introduced me to a cool app called Fooducate. 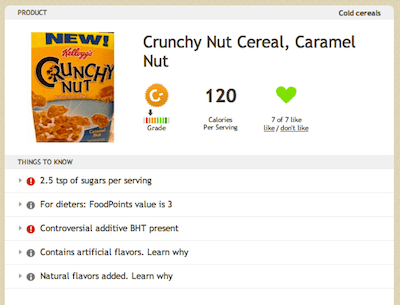 You can search for foods online or just scan the barcode of a food product with your phone and it gives you nutritional information like this. Most things aren’t surprising. Dr. Pepper gets a D? Wow! Organic carrots get an A? Who would have thought? But it is very useful to discover what foods pretend to be healthy but aren’t. Even the most nutritious looking, name brand protein bars get lousy scores. Just eat a Snickers instead (cheaper and tastier). Cereals are often much less healthy than you’d think. I recommend checking them before you buy. If you want a treat, then don’t worry about the score. But don’t be fooled into thinking you are eating healthy when you aren’t.